Called by Renaissance humanist Conrad Celtes "the German Sappho," Hrotswitha (ca. 935–1000) was a prolific author who wrote eight legends in verse, two historical epics, and six plays in rhythmic prose. This bilingual edition contains the complete Latin text with facing English translation of her six plays, Gallicanus, Dulcitius, Callimachus, Abraham, Paphnutius, and Sapientia. The Latin text, from the 2001 Teubner edition of Hrotswitha's works, appears with a facing English translation. The translations are adaptations for the stage, and include stage directions, which have been added in order to facilitate reading and performance. Students, historians, and lovers of drama will find much to enjoy. In 1501 Celtes published Hrotswitha's works, which he found in a forgotten manuscript, along with eight woodcut illustrations by Dürer and other contemporary artists, three of which are reprinted in this bilingual edition. The influence of ancient and classical Latin authors is evident in the style of Hrotswitha's Latin. Her plays present a Christian alternative to Terence's six plays. Based on the lives of saints and martyrs and featuring monks, nuns, hermits, and other religious figures, all of Hrotswitha's plays show, as she says in her Preface to the Plays, "weak women who triumph and cause strong men to retreat in confusion." Hrotswitha, a canoness in Gandersheim Abbey in Saxony, died after the turn of the 11th century CE, after having apparently been the first person, and certainly the first woman, to write dramatic literature in Latin since the classical period. Hrotswitha has thus garnered appropriately significant attention from feminist scholars and historians of drama, and it is generally within those two traditions that the present edition of Larissa Bonfante's translation of Hrotswitha's plays appears. This first bilingual edition of the plays pairs Bonfante's 1979 translation (with contributions from Alexandra Bonfante-Warren and revised by Nicole Diamente) with the Latin text edited by Walter Berschin in 2001. The English text is intended for performance, and it thus provides an avowedly non-literal translation while also interpolating stage and acting directions at many points. In order to make such a text accessible to modern students, the translation takes some liberties, for example unpacking the connotations of patrona in the dialogue itself rather than construing it simply as "patroness" and providing a distracting footnote (xvii and 402). The English also becomes more readable by "loosening up the extreme compression of the Latin" (xviii), for example rendering Latin ita as "You are quite right; it may well be so" (28-29). This approach produces a readable and fairly natural text that also remains generally faithful to the original. Indeed, the translation reads quite smoothly and seems well suited for students interested in the plays as dramatic pieces with an eye to actual performance. The mise-en-page and copious stage and acting directions facilitate that end, and the translation would work well in a performance situation. That specificity of audience raises the main problem with this current edition, namely the presence of the original Latin text. It is unclear what value the Latin text provides considering the audience for which it seems most suited and the non-literal nature of the translation. The departures from the original text are not marked, and the translation thus seems less than helpful in guiding students early in their learning of Latin, while advanced students should need no such help. Moreover, the Latin text printed in the bilingual edition (Berschin's) is not the text that served as the basis for the original translation (Helene Homeyer's 1970 edition), creating additional opportunities for confusion. Pragmatically, the lack of modern punctuation in the Latin text and the absence of grammatical notes prevent this edition from providing the same quality guidance found in the best publications from Bolchazy-Carducci. The introductory material new to the bilingual edition is rather derivative and also unfortunately suffers from some mechanical errors. For example, some works cited only in short form in the footnotes do not appear in the bibliography (specifically in n. 8 on xi, which employs MLA citation style rather than the Chicago style of the other notes, and in n. 14 on xiv). The promulgation of the tired stereotype that medieval texts only rarely (if ever) follow the "rules" of Classical Latin (x) is a disappointment. The discussion of sources focuses more on Hrotswitha's non-dramatic writing than on the plays and in fact provides little more than summary, whether of the plays themselves or of secondary scholarship (xiv-xvi). While the preface to the bilingual edition never completely hides its debt to various secondary sources, the depth of that debt goes unacknowledged in several places. 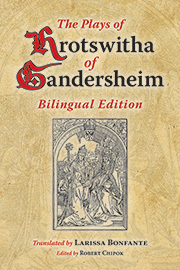 This bilingual edition provides an English translation that should prove useful to students and classes seeking an accessible text ready to be performed. The utility of including the original Latin text, however, remains unclear, and the quality of the new prefatory material leaves much to be desired.